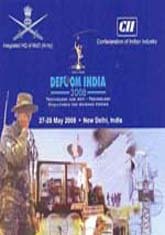 Confederation of Indian Industry (CII) and the Corps of Signals, Army Headquarters organsiedDEFCOM INDIA 2008: “Technology and Anti Technology Challenges for Defence Forces” on 27 and 28 May 2008 in New Delhi. Honb’le Raksha Mantri Shri A K Antony inaugurated DEFCOM INDIA 2008. General Deepak Kapoor, PVSM, AVSM, SM, VSM, ADC, Chief of the Army Staff was the Guest of Honour. Lt Gen SP Sree Kumar, AVSM, ADC Signal Officer in Chief, Indian Army delivered the Theme Address at the Inaugural Session. Some of the key speakers at the seminar included Mr M M Pallam Raju, Hon’ble Raksha Rajya Mantri Maj Gen P Mohapatra, Additional Director General (SI), Integrated HQ of MoD (Army, Maj Gen DV Kalra, Additional Director General Information Systems, Integrated HQ of MoD (Army), Lt Gen ZU Shah, PVSM, SM, VSM, Deputy Chief of the Army Staff (P&S) Integrated HQ of MoD (Army), Lt Gen N Thamburaj, GOC-IN-C Southern Command, Mr Krishna Dhawan, Managing Director, Oracle India Private Limited, Maj Gen Ashok Khosla, AVSM, Additional Director General Tactical Communications, Integrated HQ of MoD (Army).